Botanical Garden (Jardim Botanico Do Rio De Janeiro), Rio - Blog from Rio de Janeiro, Brazil | South America!! We slept late for the first time since we left home. No driver to meet, no plane to catch. What a pure pleasure to sleep until 7:30 am. Now this is vacation! The downside of this luxury was that our hour-long walk on the beach was much hotter than it was when we were doing the walks at sunrise. I wish I could can-up some of this heat and send it back home so you all could feel real Rio heat. Before I get into today, I need to talk about last night. Afer our outing with Renato, we rested yesterday afternoon - we have been exhausted since we arrived here. While Stan slept, I wrote the blog. We had already decided we'd like seafood for dinner. Shouldn't a city on the ocean offer great seafood options? Yes! But beef reigns here. The hotel staff recommended O Peixe Vivo. We took the waiter's suggestion and had sea bass, steamed potatoes and the most fabulous salad I have had in a long, long time. Deliciouso!! All this was preceded by two complimentary Caipirinhas, Brazil's national cocktail. This drink is made with cachaça (pronounced: kah-shah-sa and made from sugar cane hard liquor), sugar and fruit, sliced, emaciated lime. Fabulous!!! And deeply delicious fish. How lucky we are! Today was a city holiday, San Sebastian Day, honoring the patron saint of the city. This meant the beach and streets were crowded with tourists and locals celebrating their day off from work. Beach commerce was already busy too during our morning exercise-walk. Young men delivering rental beach chairs and umbrellas from trucks on the street to the beach were busy carting heavy loads out to the beach. Other trucks were dropping off huge bags of green coconuts to supply all the bars and snack shops along the beach. And for the first time we saw vendors usually found in flea markets setting up shop along sidewalks lining the beach. And yes, we saw a couple of groups who obviously continued yesterday's party through the night until morning. Today was ours. We decided to take the Metro downtown to see Escadaria Selaron, (famous steps), but we switched today's plans with tomorrow's based on some good advice from the front desk. Seems since today is a holiday, business people who would normally be downtown wouldn't be there. The chance of us running into thieves and unsavory people would be too great, especially since they would figure us as gringos the first time we spoke. We opted for the Botanical Gardens. We love botanical gardens and try to visit them in most cities we visit in our travels. While each is different, they all are beautiful, peaceful and a place of learning. Today was no exception. Yes, the weather here is very dry and hot so the plant life was not nearly as lush as it could have been. While some of the plants were suffering, many of the plants are well-suited to this environment. We saw mango and palm lined lanes, we saw an area devoted to the Amazon, and we walked through a Japanese Garden that in the heat of Rio de Janeiro, did its best to impart an idea of what a cool and serene authentic Japanese Garden might be like. 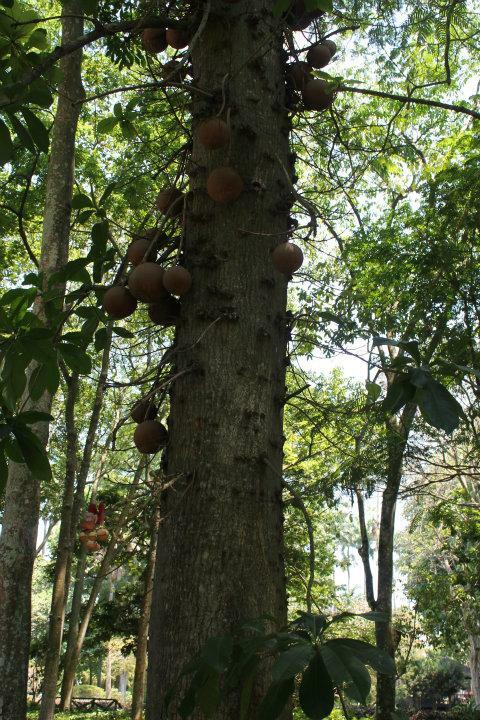 Most exotic and interesting of all plants was the Cannon Ball tree. How do I describe this wonderful thing? it was tall like most trees but the leaves were mainly at the very top of the tree. Along the trunk it produced orchid-like flowers and big, round fruit that look like cannon balls! You must see the photo. We've never seen anything like it. Finally, we found the cinnamon tree and a camphor tree fwe had heard about. These trees are easily identified not by their appearance so much but by picking up a dry leaf at the foot of the tree, crushing it and taking a sniff. I hope to get home with one of the leaves from each tree. We made our excursion by city bus today. Getting to the botanical gardens was easy. We just followed the instructions from the guy at the front desk of our hotel. Getting home was another story. The bus our hotel guy told us to catch did not come. Luckily, we got together with some young men who although could not speak English communciated with us somehow and together we figured out an alternate bus that would take us back to Copacabana Beach. Lucky us! The bus dropped us off exactly where we needed to be to pick up some Vitamin C and some cold medicine. I have caught a cold, grrrrr! And Stan is trying to avoid it with the vitamins.